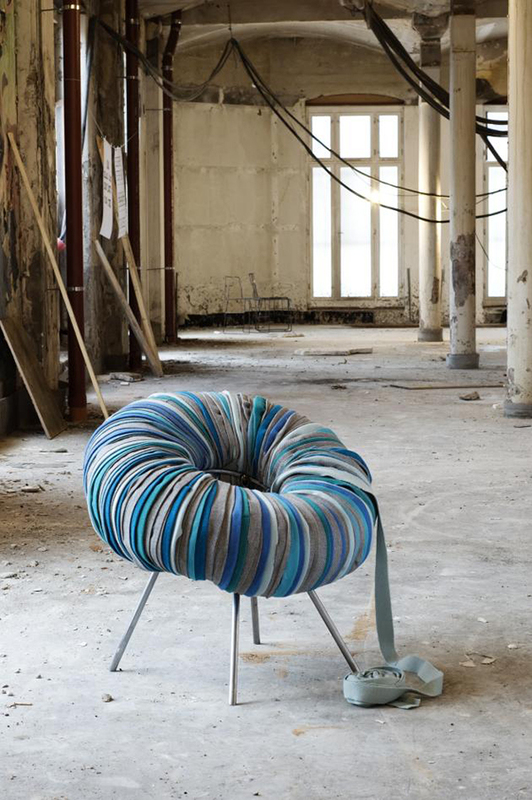 When it comes to reusing unwanted materials in an innovative way, it seems the humble seat can be made from just about anything. Looking at the designs below, seating can also surprise and delight as a striking art piece. If you’re sitting comfortably, read on to see some of the wildest chairs imaginable, all made from repurposed materials. 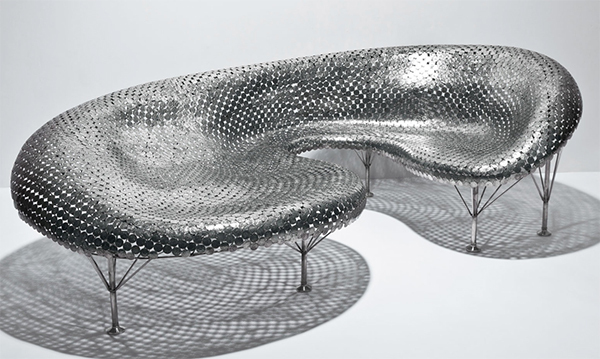 Pictured above – Nickel Couch by Johnny Swing made from welded nickels. Award-winning South African designer Ryan Frank, calls his work Free Range Furniture and focuses on using sustainable materials and recycled objects. 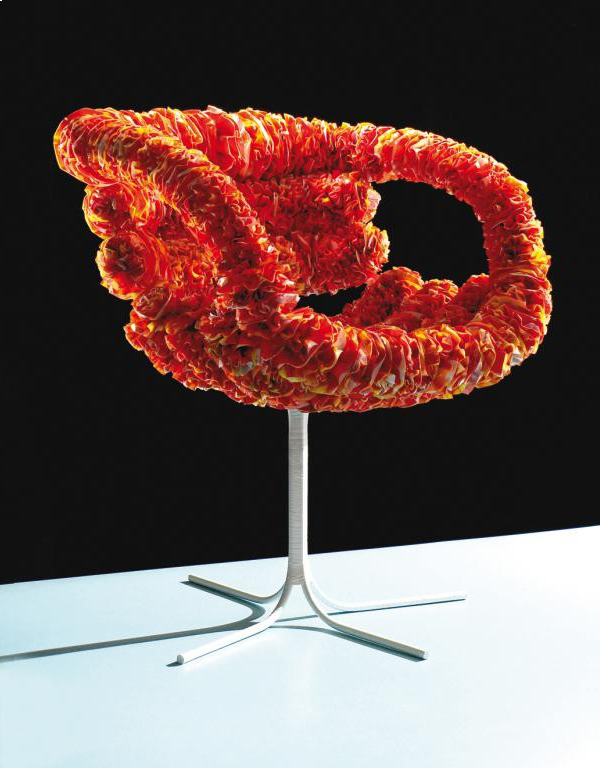 Upcycled gems include this limited edition Inkuku chair, made entirely of plastic carrier bags. The project was inspired by South African townships where the same wrapping technique is used to create handcrafted chicken ornaments. For furniture that certainly goes against the grain, check out US design company BRC Designs, headed by Benjamin Rollins Caldwell. 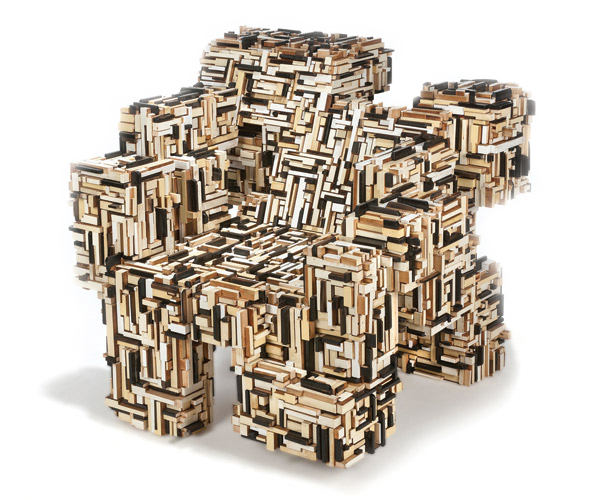 With pieces made from playing cards, photographic slides, books and – as illustrated in the Korobeiniki Chair above, old piano keys, this stuff really is out of this world. The Drops chair by Norwegian designer Camilla Hounsell Halvorsen is made from inner tube covered with strips of recycled upholstery material. 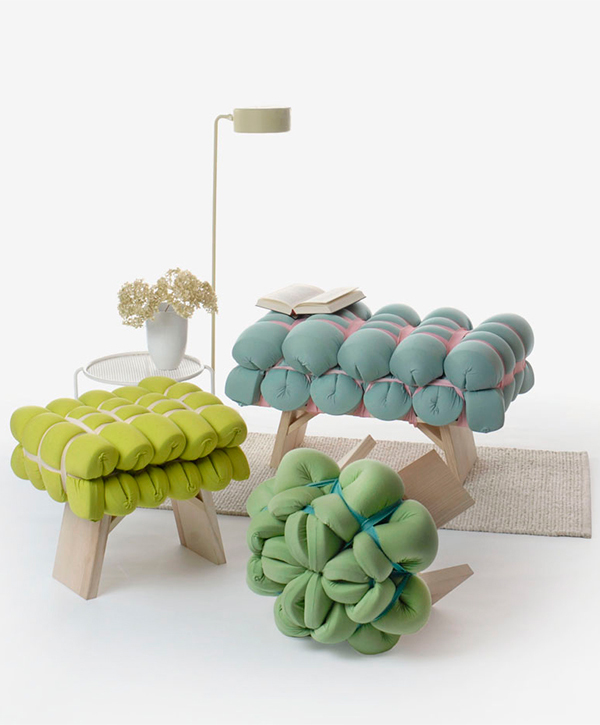 The ring can be tilted into the desired position of the user and can also be removed from the frame to be used as a pouffe. First exhibited at Milan Design Week 2011, Sparvar is a spray paint can armchair and pouf, designed by Luigi Semerano. It’s made of over 200 empty cans of spray paint used by street artists. The cans are supported either side by two painted wood panels. Swiss designer Boris Dennler has worked with recycled materials in his work for over 10 years. 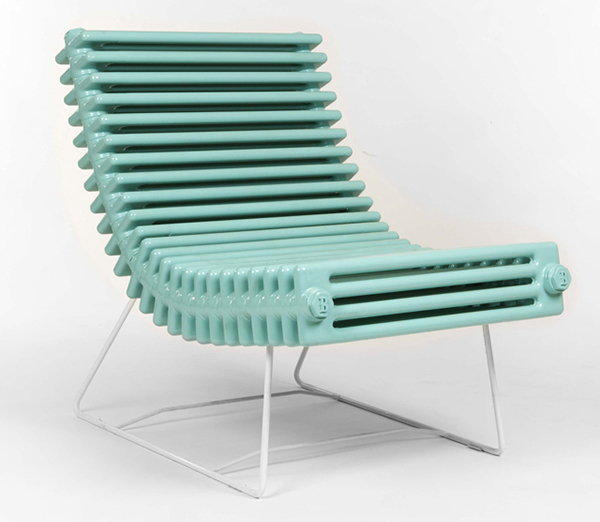 His Radiator Chairs made from hand bent radiators have become iconic pieces of upcycled furniture with each one signed and numbered by the designer. 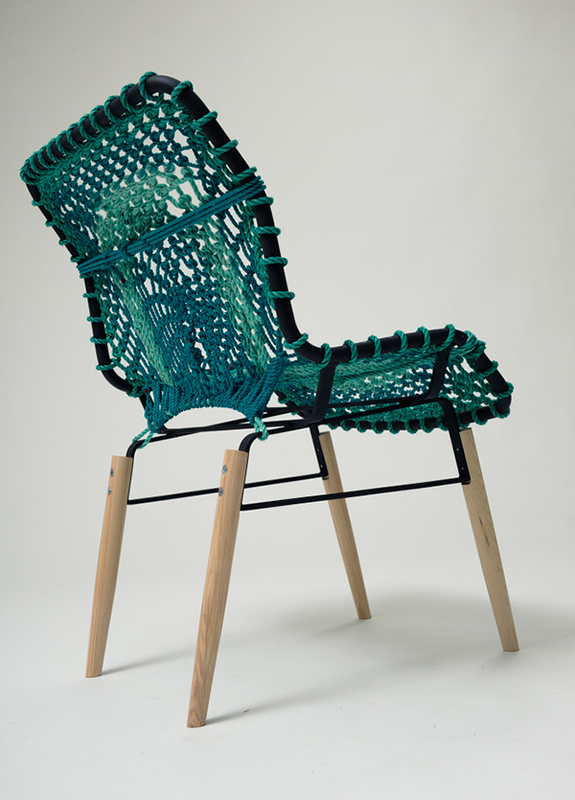 Swedish designer Hampus Penttinen has made a chair from woven flotsam rope. In response to the global problem of polypropene trawling nets and cut off anchor cables that get washed up on to the coast, Svartskär is made from a grafting technique usually used for covering fragile decorative objects. The rope used comes from the shores of Kosterhavet, Sweden’s only marine national park. Johnny Swing‘s Coin Furniture collection blurs the lines between art and furniture design. 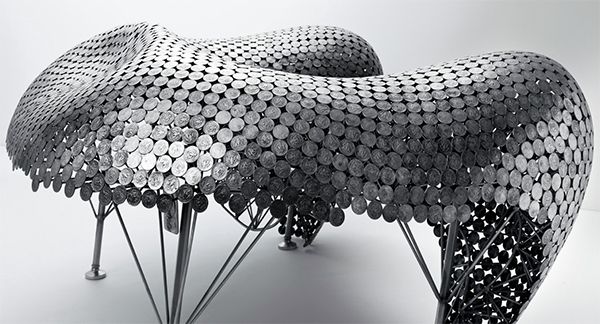 He welds together coins to create seating in beautiful organic shapes. 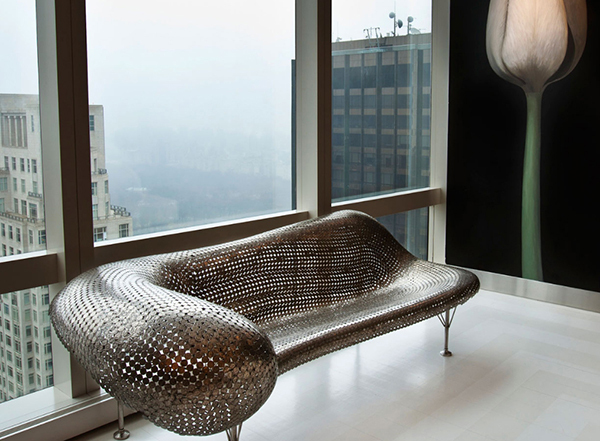 The sofa above is called All the Kings Men and is made from welded JFK half-dollars and stainless steel. 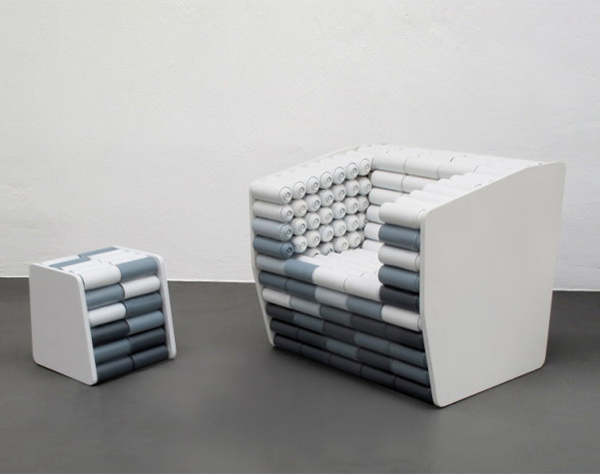 Zieharsofika (2013) by Meike Harde demonstrates a unique approach to upholstery which involves the repurposing of conventional rubber foam mats. The mats are transformed with elastic bands, giving the seat a comfortable cushion texture and striking ornamental form. 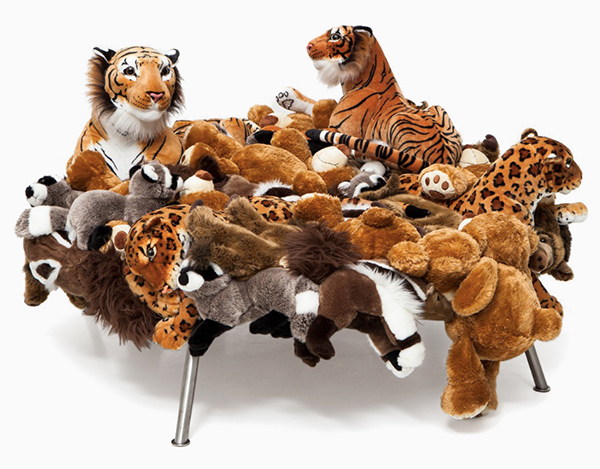 The iconic stuffed animal chairs by Campana Brothers is not for the faint hearted. Cake Stool, like all their cuddly toy chairs, re-contextualises an overlooked, mass-produced object whilst playfully referencing the ‘luxury’ that gets associated with animal fur. Surreal, fun or disturbing? Well it does look quite comfortable. 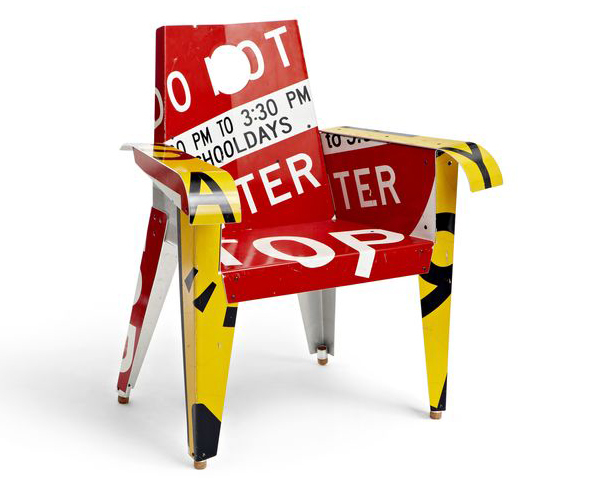 Transit chairs by Boris Bally are made from cold connected recycled steel street signs. All edges of the traffic signs are flattened and hand filed so that their no longer sharp. In addition, the Rhode Island based metalsmith/designer upcycles the signs into wall sculptures, key chains, tables and mirrors. He also works with golf tees, crushed can blocks and weapons that have been destroyed.